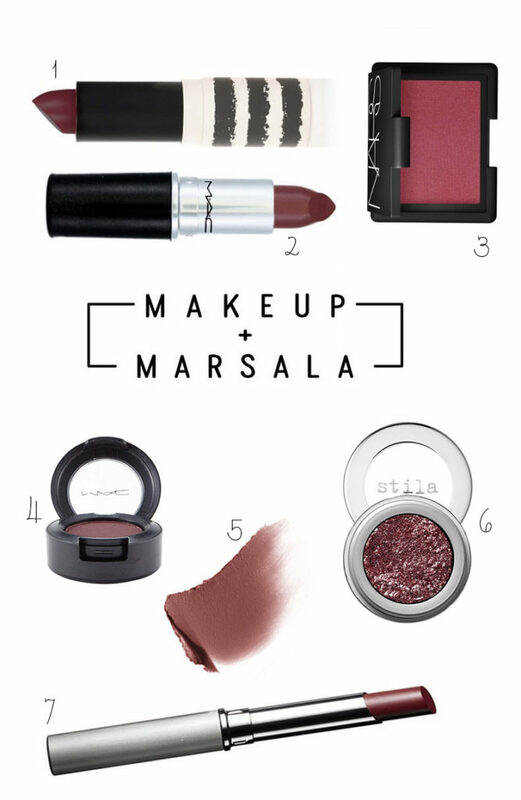 Last month we met the color of the year, Marsala, and talked about incorporating it into our show outfits this year, so I thought it fitting to also do a beauty post! Such a gorgeous, warm, rich shade, right?? And it has to be some sort of good omen that the main color for the upcoming year is the same hue as red wine, right?? Falling somewhere between rose and brick, the hue is a total throwback to the 90’s, when Kevyn Aucoin made it huge. But its recent appearance as the Color Of The Year should come as no surprise, since this deep, moody look has been on the rise recently. Just ask Kylie Jenner. She has been spotted with this shade across her lips on more than one occasion (and in more than one selfie). As far as makeup goes, the color is for sure more wearable than other recent Pantone picks (**cough**, Radiant Orchid), and it is super glamorous… so I’m feeling pretty happy that it will be around for more than just the winter. Plus, it’s flattering on practically every skin tone – bringing a subtle flush to mocha complexions, while the pink undertones really pop on alabaster skin as well – translating well into wearable makeup products for the lips, cheeks and eyes. Your lips are probably the most obvious place to wear it (as well as my personal favorite). For those who generally like experimenting with color, but want something a little less intimidating than a vampy shade, Marsala is a great compromise. And because the color flatters the mouth’s natural pigments, it works for everyone. Just swipe it on and channel your inner Kate Moss. It also looks really beautiful as a pop of color on your cheeks. Pair it with a gold eye shadow and a neutral lip for daytime, or kick it up a notch for night by layering the hue on your lips with a dramatic black eyeliner look. 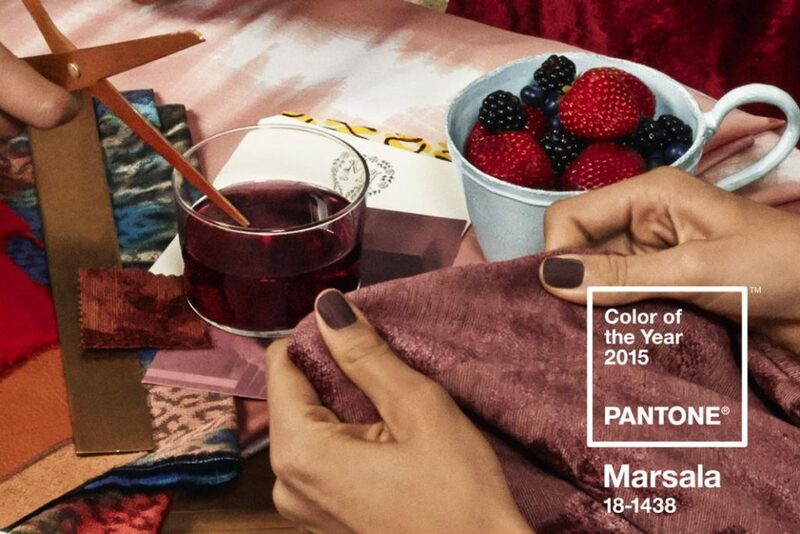 It is time to meet the color of 2015 – MARSALA! 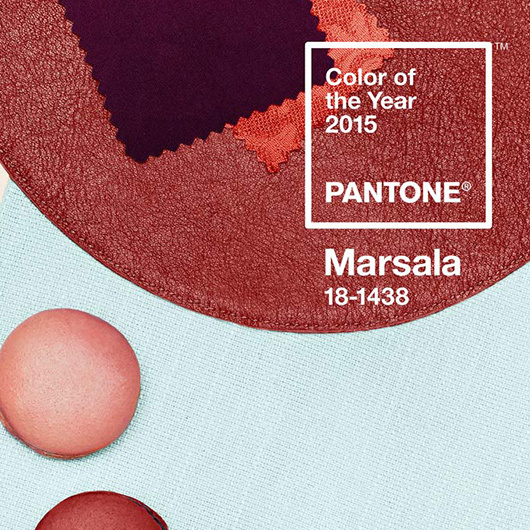 Just last month Pantone announced the 2015 must-have Color of the Year: Marsala. Praying the color wasn’t going to resemble the chicken marsala served in Italian restaurants, I reached out to my BFF, Google… To my delight, I found it is more of a rich plum-brown that actually resembles the glass of vino I often sip on at dinner. “It is such a deliciously warm shade, you can almost taste it just by looking at it,” says Pantone Color Institute’s executive director, Leatrice Eiseman. Despite the fact that the initial reaction of the hue has been mixed (“icky” commented one critic, while another compared it to “freaky dried blood”), I have to say I love it. The burnished undertones of Marsala make it so much richer than last year’s Color of the Year, Radiant Orchid, which “encouraged creativity and innovation.” Marsala, on the other hand, “enriches our mind, body and soul, exuding confidence and stability,” says Pantone. And who couldn’t use some of that in the show arena?! But what I really love is the ease in which this “hearty, yet stylish” color can be combined with black, gray, beige and other neutrals that we so often wear in the ring. I mean, how gorg is that shirt? And those same burnished undertones also make Marsala highly compatible with gorgeous colors like amber, umber and golden yellows, as well as greens in both turquoise and teal, and vibrant blues. And – oh my – I must say it looks even more stunning with metallics! 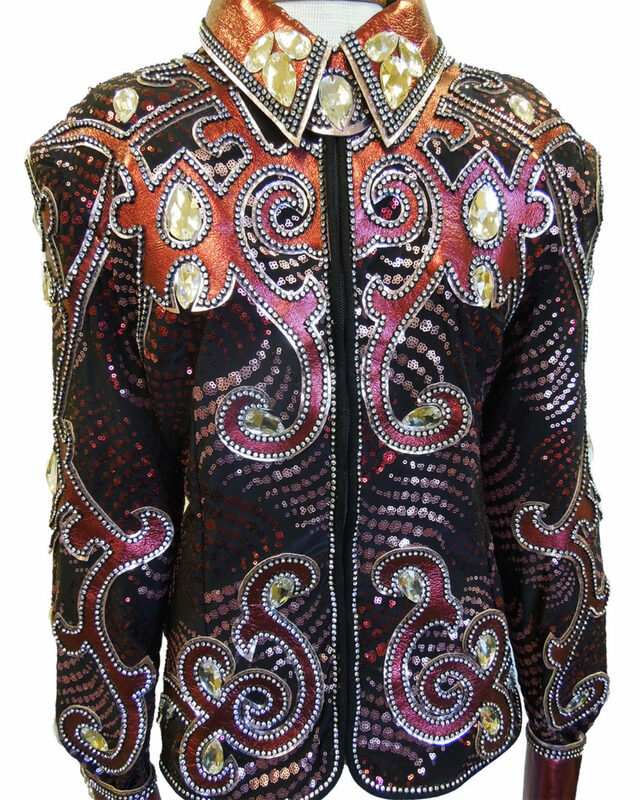 I’m already dreaming up the lace Marsala vest and matching Marsala silk shirt – adorned with big and beautiful Marsala crystals on the collar – that I want to have made to go with my black suit. **Swoon**. Your trainer always knows best, right?? Well, in reference to your horse, yes, I think we can all agree that is most likely true. But do you take their opinion when it comes to the way you “suit up” in the show arena? To be honest, I totally ask my trainer, Joel Kiesner, what fabric swatch he likes better for a horse when I am picking out a new suit. And, evennn if I don’t always go with his preference, I still always take his opinion into consideration, and it can have an influence on my final choice. Because, even if they don’t all totally know best when it comes to fashion, they know best when it comes to your overall look in the show arena. Which is why we wanted to hear from them! Get the inside scoop on what these trainers reallyyyy think about today’s riders fashion sense in the show arena, and how they think we should all be presenting ourselves to the judges. You never know – you might learn a thing or two! Show Season: How would you describe today’s riders fashion sense in the show arena? Christine Curtin Ryan: Today’s look is very modern, and crisp. I also think our fabrics have a very elegant feel. John Golladay: Probably trend driven. 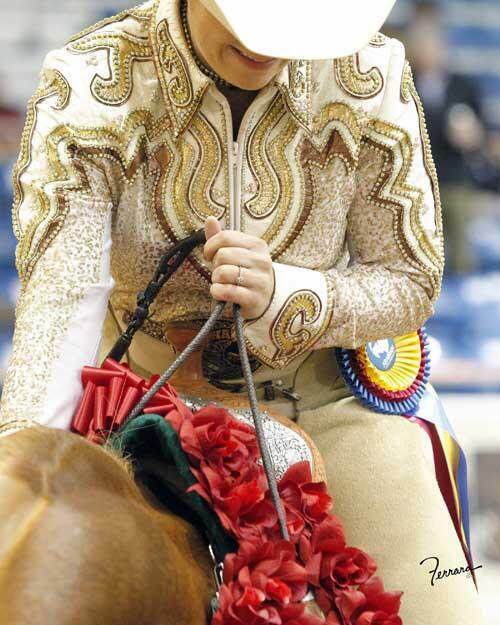 Vicki Humphrey: Tradition is the word that comes to mind when thinking of show ring fashion. It has a long history of sophistication, taste and class. As style change, those are the key words to remember. Jonathan Ramsay: I think today’s riders each have their own unique fashion senses in the ring. I think for the most part everyone still has a very classic and professional look. Ashton Kiesner: I think today’s riders fashion sense in the show arena is really fantastic. I really like all the different colors and fabrics that are coming out. I think the bling is more tasteful and there are greater risks with the suits, but it seems more conservative risks, if that makes sense. SS: Is there a certain way you hope for your rider’s to present themselves in the show arena? Christine Curtin Ryan: Number one for me is fit. I like my riders in a suit that fits. You’re not fooling anyone when you cram yourself into a suit that is 2 sizes too small. I also like a color that compliments the horse, or at the very least, doesn’t detract from the look. John Golladay: I think a finished picture is the ideal look. From horse to rider every detail is important. Vicki Humphrey: A perfect custom fit is paramount; no matter the expense of the material. And CONSERVATIVE colors that let the horse stand out. Jonathan Ramsay: I prefer that my riders have a clean cut and classic look that makes the whole picture of the horse and rider look classic and elegant. Ashton Kiesner: I think putting a suit together is a fun way for riders to express their individual personality though fabrics, ties, lapel pins, etc. Riders need to remember when putting together a suit, suitability to horse, the class they are showing, and the time of day/evening they are showing. I don’t understand when there are 20 country riders in a class and everyone has on a brown or navy suit. It is the little things that set each other apart. And I believe this goes for all the disciplines. Ringmanship and polished riding skills will set you apart, but so does your look. Also, although I love the traditional look, recently I have seen more day coats and I think they are fun on the right rider/horse combo. Some riders are going with a lighter color suit and again, with the right horse and rider combo, it can all work great. SS: What do you think a polished and cohesive look does for the whole picture? Christine Curtin Ryan: For me, a well turned out rider is to the horse, as a frame is to a painting. The focus should be on the horse (painting). The rider (frame) should accentuate, but not compete with the horse. Jonathan Ramsay: I think overall it makes the big picture much nicer. I think it adds to the natural beauty of the horse instead of having a messy look take away from the overall appearance. 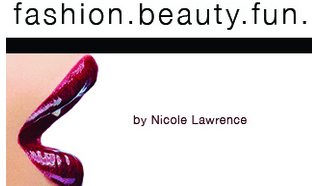 Ashton Kiesner: I think it is really important to have a polished and cohesive look from head to toe. And don’t forget the hair – neat and tidy. That is super important too. Bling or no bling, a polished look will show the judges that you are a serious competitor who has taken the time to be dressed appropriately; so, you must have the best horse too, right??? SS: How would you describe your own fashion sense? Christine Curtin Ryan: I’m rather conservative in my own fashion sense. I do like very pretty ties though. John Golladay: I’ll be honest most of my suits my wife, Leah Beth, puts together. So, in that case, fantastic. Johnathan Ramsay: I prefer to keep my outfits clean cut, classic, and sharp. I don’t like anything wild or too bold that takes away from the horse or overall picture. Ashton Kiesner: I believe my personal English Pleasure style would lean more on the conservative side. I am a professional rider, so I think the professionals should be more conservative; it is not about us, but the horses we are riding. Professionals need to look professional. That being said, I do love beautiful rich fabrics, like browns, blacks and navys; usually a tone on tone. SS: What is your take on “bling” in the ring? Christine Curtin Ryan: My take on bling? If that’s your style – go for it! The best way to be comfortable in the ring is to be comfortable in your clothes. John Golladay: A small amount goes a long way. Let your horse be the one shining in your class. Vicki Humphrey: Bling is great, when done tastefully in small areas, like on a vest. All riders want to be different and stand out. A sparkly vest, a dynamic tie, or a lapel pin that sparkles are all great, when they are done within the guidelines of class and taste. Jonathan Ramsay: I think “bling” is okay in moderation, but I am not a fan of excessive “bling” that takes away from the overall appearance of the horse and rider. Ashton Kiesner: I personally am not a huge fan of major bling. I believe if you are a very good/confident rider with a great horse, tasteful bling is great. Tasteful bling makes a statement that you are here and you want to get noticed, you just need to back it up with a fun attitude. If you are a timid rider or a newer show ring rider and you don’t quite have the confidence yet, then I think your outfit should match who you are. Bling for the sake of just trying to be noticed, without the well fitting, thought-out outfit, is over doing it for me. SS: In your opinion, what does a piece of clothing need to have to really pop? Christine Curtin Ryan: The attitude to pull it off. John Golladay: A great horse underneath it. Jonathan Ramsay: I don’t think it has to be anything wild to make an outfit stick out. I think a nice splash of color with a tie works wonders! Ashton Kiesner: I love ties!!! I believe this is where you can go wild!! You can do an entire outfit around a cool tie. Don’t skimp on the tie, it is just as important as the rest of the suit!! Many of you probably already know Show Season Rider, Audrey Hart. I mean… she has been apart of the Arabian horse community practically all of her life, competing at the Scottsdale Arabian Show when she was only two-years-old! Continuing on since then she has continued to make quite the impact, having won many titles, including 2013 National Champion last year, in the Arabian Western Pleasure AAOTR 18-35 with Vallejo Moonbeam. Show Season: Describe your riding fashion style. Audrey Hart: I believe in the big picture! When designing an outfit it is easy to get caught up in the small patterns and minuet details, and when you step back, it looks like mud. I like to pick a simple color scheme and make sure that from a distance, there is still a “WOW” factor! SS: What is your favorite head-to-toe riding outfit? AH: When I showed walk trot (1800 years ago) I had a forest green outfit. It was forest green crushed velvet with cream, red and green horsehair braided piping and silver conchos. I had the forest green chaps to match. When I look through old pictures, that is still my favorite outfit! SS: Do you wear anything for good luck in the show ring? AH: A brand new pair of socks. I buy a new package of socks before every show! SS: What is one thing you never go in the ring without? AH: Every time I am walking towards the gate to enter a class, my dad says, “Don’t beat yourself.” I play those words through my head 100 times each class and it keeps me from overacting or getting to extreme in my show ring tactics. SS: How would you describe your non-horse show style? AH: I like a clean, traditional style with modern accessories. Fun jewelry, shoes or a wild shirt paired with a nice pair of jeans is my staple. SS: What has been your biggest accomplishment as a rider? AH: Making the finals in the Arabian Junior Western Pleasure at US Nationals on Sunstormm is the highlight of my show career. I had always wanted to show in a class with my Dad at nationals! SS: What are your riding goals for the future? AH: I would like to keep improving in the reining pen. It is a new venture for me and it is so challenging! SS: Who has been the most influential in your riding career? AH: Naming one person is impossible! My parents, Bob and Kathie Hart, obviously deserve all the credit for all my success with Arabians. 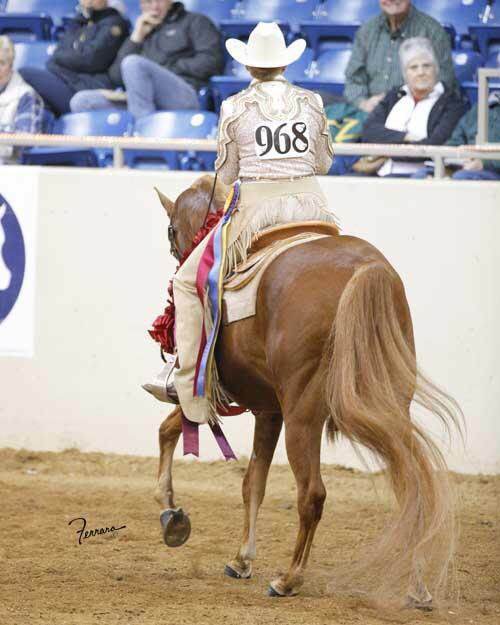 But Mary Trowbridge and Crystal McNutt have also help me immensely with my horsemanship and showmanship.